Testing some ideas combining D and R, I think I like 2 the best out of these. Har jag närt en KOMMUNIST vid min barm?!? 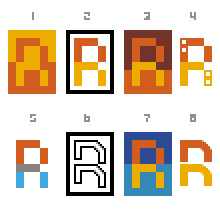 I think the merged D-R insignia gets a little too abstract… will probably be hard to get people to make the connection in their heads to the words Data Realms. Why not just keep it clear and pixel-clean? [Arne edit] Maybe, but on the other hand logos are supposed to be rather abstract simplifications because you don’t want to type out the entire thing. [Arne edit:] Umm? Thinner on the left. Can we submit our own ideas too? Part of the the idea of this devlog is to tie in feedback from players and enthusiasts during the development cycle of our projects. Also, if something significant you submit somehow does get into a game, the most you can expect in return is a mention in the credits. The [DR Edit] one before the last has it all, simple yet sophisticated. The similar ones have only one colour and making out the D from the R is a bit hard IMO. Some nice ideas. I could try some things. But I would need some background information/research. You can contact me vial mail (you should have the adresse already as I need to giveone to post here). I have seen screenshots of D.I.R.T. and Proms ideas/sketches/illustrations on CA.org so I think I have some little idea what’s going on. But that is not enough to be helpful. I would need something like a manifesto or guidelines. Otherwise it’s like walking through a desert. There’s an open way everywhere and I don’t know if I will die of thirst or find some water. The DR logo is for Data Realms LCC in general, so it’s just a matter of playing with the words and letters here, and add some retro gaming feeling to it maybe. As for D.I.R.T. Yeah, there needs to be some sort of description of the game loop somewhere. I suspect Mr Data has some plan there involving this site.